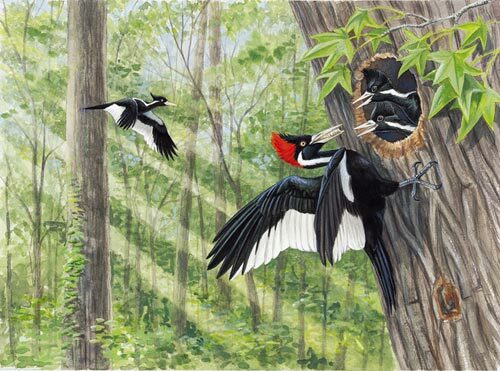 The Ivory-Bill, Found Our commentator and other bird-lovers around the world are excited at news that the ivory-billed woodpecker has been rediscovered in the Arkansas wilderness. But now she's begun to worry whether the bird can survive all the attention mankind will heap on it. 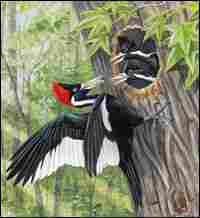 Our commentator has been dreaming of ivory-billed woodpeckers since she was eight years old. 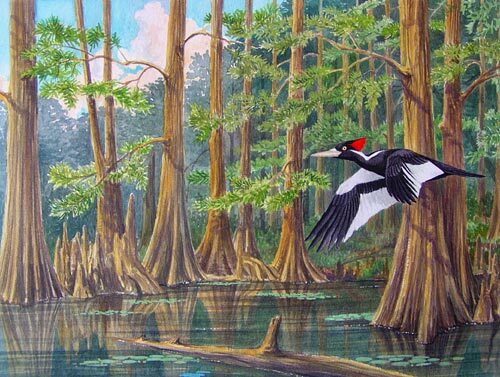 She and other bird-lovers around the world are excited at news that the species, once feared extinct, has been rediscovered in the Arkansas wilderness. But now she's begun to worry whether the bird can survive all the attention mankind will heap on it. 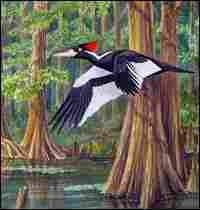 Illustration of ivory-billed woodpecker in flight. Illustration of feeding time at the nest.